Plastic bottles exploding in dustbins, colour changes and chemical magic with liquid nitrogen were just some of the exciting experiments schoolchildren saw demonstrated at Salters’ Festival of Chemistry held at London South Bank University (LSBU) on Thursday 18 May. 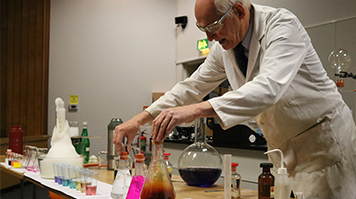 The Salters’ Festival was organised by LSBU in partnership with The Royal Society of Chemistry and is one of a series of 49 educational festivals taking place at universities and colleges throughout the UK and the Republic of Ireland between March and June 2017. The event played host to around 56 students from 14 schools drawn from the local area. The pupils enjoyed an exciting day of applied chemistry workshops, with each school represented by a team of four 11-13 year olds. This popular annual event is the brainchild of The Salters' Institute, whose aim is to promote the appreciation of chemistry and related sciences to young people, and encourage them to take up careers in the teaching of chemistry and in UK chemical and allied industries. During the morning the teams took part in a competitive, hands-on, practical activity - “The Salters’ Challenge – Who is the Prime Suspect?”- in which they were invited to apply their analytical chemistry skills. In the afternoon, they competed in a “University Challenge” competition – a practical activity chosen by the University, in which they were required to produce a chemical clock run on energy generated by the reaction between Sodium Thiosulphate solution and Hydrochloric acid. This session was followed by an entertaining lecture entitled ‘love food, love science’. The day ended with a prize-giving at which all participants and teams were presented with individual prizes and certificates for participating.